A string of gruesome murders have been committed in Washington D.C. Without anything to connect them, FBI Special Agent Patrick Bowers faces his toughest case yet. Steven James has shown his talent of creating intense, riveting thrillers with the first three novels of the Patrick Bowers Files. With The Bishop, he only gets better. In The Pawn and The Knight, we followed Patrick as he tracked down serial killers, and we followed him as he investigated an arson case that turned out to be much more than he ever expected in The Rook. Now, in The Bishop, we are pulled into a story with both an intense serial killer (killers in this case) story and a political conspiracy that takes the reader on a ride full of twists and turns like a popular rollercoaster. As with the previous novels in this series, this book keeps us guessing and in suspense all the time. There is no let-up in the intensity of the story. Whether it be progress in the case of the murder of a Congressman’s daughter or a confrontation with Tessa’s– Patrick’s stepdaughter– biological father, I found myself wanting to keep on reading. Once the twist that Steven is so famous for was unraveled, the rest of the book rocketed up in the intensity level, leaving me in shock. One thing that makes this whole series great is the developing relationship between Patrick and Tessa. They have been through so much together throughout the three previous books, and their relationship develops perfectly throughout The Bishop. It’s not wrapped up neatly nor is it a jumbled mess; they have their confrontations with each other just as they might have if they were real people. 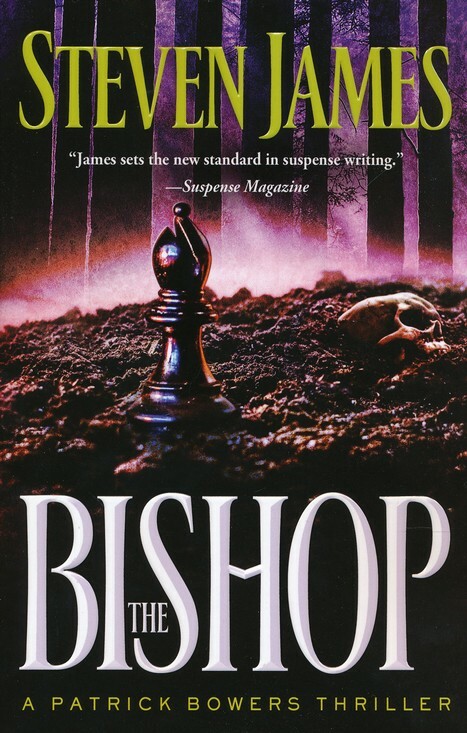 Again, as with the previous books in this series, The Bishop is not for the faint of heart or the timid. Steven does not sugarcoat the violence in this novel, but makes it realistic. He shows us the true brutality of the crimes that the killers commit and it sure isn’t pretty. I encourage you to pick up this series if you like intense thrillers. You will not be dissappointed! Also, be sure to read them in order (The Pawn, The Rook, The Knight, The Bishop, The Queen)! I am reading The Queen right now, and it is amazing! I am looking forward to what is in store for Patrick, Tessa, and the other characters in the book. I am sure it is going to be intense and as thrilling as the past four books. Also, Steven is releasing a prequel to the series called Opening Moves this summer! If you don’t get the other books by then, Steven suggests that you read it first, so be sure to do that!